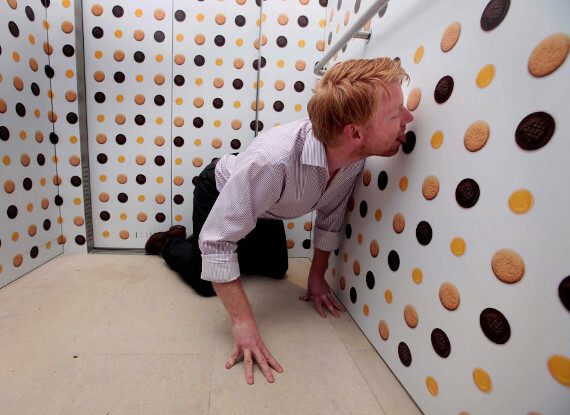 In news that would make Willy Wonka proud, Mischief PR agency and McVitie’s have created the world’s first lick-able wall paper comprised of 1,325 Jaffa Cakes. Currently it’s installed in an office building’s elevator in London, but they hope to bring it to more locations in the future. Totally cool and all, but isn’t all wall paper lick-able? If you think about it, anything is lick-able — it just doesn’t always have a pleasing taste. The real issue here is whether or not it’s sanitary. You don’t know what contagious, ooky person has been licking on them cookies! Just kidding, you know I don’t give a single dang about germs. Hell, I’d eat a lollipop off the sidewalk if you gimme a dollar. In fact, I’d do it for 50¢ if it’s got hair stuck to it. I’m nasty!! Next they’ll be making snozberry! what if someone with ebola licked it then u did?????!!!? ?